Is the name trademark-protected or is it generic? What’s the difference between Kleenex and tissues? Between Sharpie and permanent marker? Between Band Aids and bandage? The first are trade-protected by the owners of the brand-names. The second are common usage. Everyday words. The name matters to companies and people making money with them. But what about a world-world emerging sport with an identity-recognition problem? Competing with football, futbol and foosball? Not that F word. Doesn’t rhyme with ‘huck.’ It’s the other F word: frisbee. What-the-frisbee is up with not being able to use frisbee when talking about ultimate? In naming the ultimate game, the word disc is often inserted in corporate-speak whenever ultimate frisbee is legally or officially discussed. Of course, within the game there’s politically correct and there’s real. Wham-O, Inc, the manufacturer of the frisbee, among other toys, wants to continue to trademark protect the name frisbee, which originally was a family name. Founded in 1871 in Bridgeport, Conn., The Frisbie Baking Company was the original maker of Frisbie Pies. The pies were contained in a plate that, once emptied of their contents, could be backhanded with surprising aerodynamic predictability. Each flying pie-plate was called a frisbie after kids played with the hurled plate in the streets, and would warn passersby by yelling the name out. Wham-O’s strident legal offense has run its course through federal courts. In a protracted form of contesting this name game through appeals vs. plaintiff Manley Toys, Wham-O doth protest too much. Manley continues to argue that frisbee has gone generic. Appealing to the federal courts has got to help lawyers somewhere, but to the ultimate community, it’s already a meh-moment. 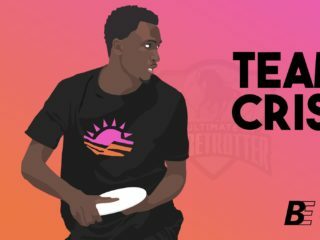 The courts are catching up with what ultimate players already know: the name frisbee has long gone world-wide and is far beyond just a pie-plate. Contesting the foul call of Wham-O v. Manley turned whiskey-tango-foxtrot long ago. It’s like the way contesting spirit fouls went south when the Roman Catholic church claimed to own the trademark rights to Christian. While the Vatican dithered with other brands like the Greek Orthodox, the Christians morphed on their own. In their contesting the spirit fouls about who had the commercial rights for Christian, other Christians flourished. While the old brands hashed it out, the new brands took off. The new evangelicals and protestants in the frisbee business, Innova and Discraft, are making hay while the defenders of history duke it out. Rather than get caught up in the rant for the rightful ownership of frisbee, the new kids on the block, like newly converted zealots, are taking over the world disc market. They are doing so without calling the product a frisbee, even though the rest of the world does. Actually, the new kids are duking it out too; much ado was made about discs this year as Major League Ultimate, the recently re-minted professional league, chose their official disc: the Innova Pulsar, for the inaugural season. This choice came over the old ultimate standard disc, Discraft’s Ultrastar. All kinds of invading zealot frisbee groups are flourishing out there. Innova’s spokesman David Shope was asked how Innova got that piece of business. 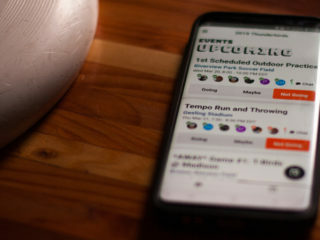 He responded via email, “The beginnings of our relationship [with Major League Ultimate] started in December of 2012 with a call from Nic Darling. “Nic indicated that a new professional Ultimate league, MLU, was emerging, and they were looking to partner with a disc manufacturer,” explained Shope. What input did players have? To say the name from a pie-platemaking family, Frisbie, which has now merged with culture, sport, history, and not to mention, for some, religion, and also has proprietary interest is to miss the point: the very name of the game has taken on ultimate connotations. What makes it ultimate frisbee? It’s not fun frisbee, or cool frisbee, has-to-do-with-Spirit-of-the-Ultimate-Game frisbee, or the pure fun of Frisbees. 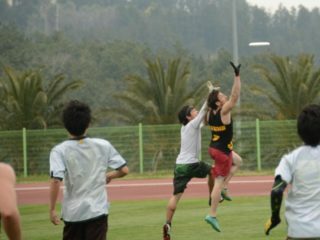 It’s just ultimate frisbee, in China or India or Africa. Which is easier to say and do than an ultimate flying disc game. Though it’s that too.